While the boats could be used to rescue some of the crew if the ship foundered, their real purpose was more mundane. Constitution’s officers and crew used the ship’s boats to communicate with the shore, carry supplies, send boarding parties to other ships, or provide support for amphibious operations. choice. Whaleboats? Aren’t those used for hunting whales? As their name would imply, whaleboats were in fact used to chase whales, but it was also a name given to a light, sturdy, double-ended boat. We have not yet discovered when the US Navy began to use boats of this type, but by the War of 1812, many public vessels were provided with them. Constitution was no exception. Receipts from New England boat builders give us a good idea of when they were purchased. Not surprisingly, the boats were produced in Massachusetts towns that had close ties to the whaling industry. In October 1812, Fairhaven, MA boat builder Barzillai Adams supplied three five-oar whaleboats to Constitution (two of them cost $50, and the third cost $55). Transporting them to Boston cost more than half the price of each boat. Mr. Adams also made boats for Hornet and Chesapeake. A few weeks later William Lovering, Jr. delivered to the ship two whaleboats built by Charles Folger of Nantucket (these cost only $40 each). But just what did these boats look like? How much did they differ from the classic Beetle whaleboat used in the heyday of the New England whaling industry? 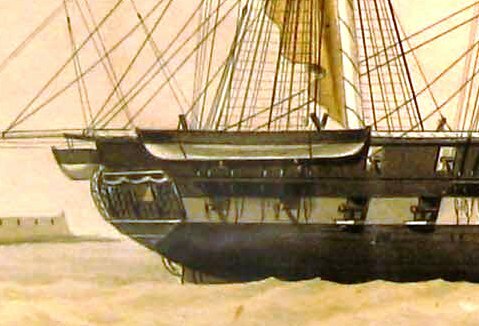 Sir: Please to have Two Whale Boats of the same description as the last you furnished me built for the United States Frigate Constitution, let them be twenty eight feet in length, one to row with five and the other with Six oars, and if possible have them completed and sent on within fourteen days. Most later (and better-documented) whaleboats were about 28 feet long and had five rowing positions, so the general form of these boats seems to have not changed much during the first half of the nineteenth century. Whaleboat of the first half of the nineteenth century, from Howard Chapelle’s American Small Sailing Craft: Their Design, Development, and Construction (New York, W.W. Norton & Co.: 1951). Samuel Yendell repaired or altered Constitution’s whaleboats in October 1812. He provided two sets of “rudder Irons”- the pintles and gudgeons- for them. This is important, because it means the boats were steered with a rudder and tiller, rather than a steering oar that was common on civilian whaleboats. Even so, when the two Nantucket-built boats were delivered, the bill included two “steering pins,” the upright wooden posts at the stern used to secure the steering oar, which would have given the coxswain some flexibility. Yendell also supplied 27 tholepins, the wooden dowels typically used to brace the oars before the invention and widespread use of swiveling metal oarlocks or crutches. The oars themselves could have been the standard flat bladed oars used by most working boats of the period. On the other hand, Boston boat builder Samuel Yendell made sets of “scoup [sic] blade oars” for Chesapeake’s boats, and in July 1814 John Wade delivered 858 feet of “Spoon Blade Oars” for Constitution. Oars with curved spoon blades are generally considered about 1/3 more efficient than the common flat-blade oar, an important consideration for boat crews who might need to row for miles. The visual record helps to fill in the gaps in the documentary record. Both Michele Felice Cornè and his protégé George Ropes, Jr. depicted boats hanging from Constitution’s stern and quarterdavits in their paintings of the August 19, 1812 battle with HMS Guerriere. In both painting series, the quarter and stern boats are painted green with red interiors, but since they have flat hour-glass-shaped sterns, they cannot be whaleboats. They are probably meant to represent the gigs or cutters frequently mentioned in the ship’s logbook. Since the whaleboats for Constitution were not delivered until October 1812, two months after the battle and a month after the ship’s return to Boston, it makes sense that Cornè and Ropes would not include them in their paintings of the battle. Detail from George Ropes, Jr.’s 1813 painting of the battle between Constitution and Guerriere. USS Constitution Museum collection. The best view of a whaleboat comes to us complements of Nicolo Cammillieri’s 1824 painting of the ship. Detail of Nicolo Cammillieri’s 1824 portrait of Constitution. USS Constitution Museum collection. In this work, a whaleboat hangs snuggly from the ship’s starboard quarter. It has a straight keel. The bottom is painted white, and the topsides black or deep green. The gunwales are also almost perfectly flat; there is an almost imperceptible amount of sheer. Today, Constitution once again carries whaleboats in her quarterdavits, but these are a twentieth century design built during the ship’s 1927-1931 restoration. According to W.E. May, the Royal Navy did not adopt the whaleboat form until the end of the Napoleonic Wars. See The Boats of Men-of-War (Annapolis, MD: Naval Institute Press, 1999), 73-74. Voucher to Barzillai Adams, 3 Oct. and 17 Oct. 1812, Amos Binney Settled Accounts, 4th Auditor of the Treasury Alphabetical Series, RG 217, box 38, NARA. Amos Binney Letter Book, American Antiquarian Society, Worcester, MA. It seems the ship did not receive these boats before sailing from Boston on August 2, 1812. Voucher to Samuel Yendell, 16 Nov. 1812, Amos Binney Settled Accounts, 4th Auditor of the Treasury Alphabetical Series, RG 217, box 38, NARA. Voucher to Samuel Yendell, 24 Dec. 1812, Amos Binney Settled Accounts, 4th Auditor of the Treasury Alphabetical Series, RG 217, box 38, NARA; John Wade Account Book, 1811-1828, USS Constitution Museum collection.